Greasy: common examples include butter, olive- and other cooking oils and fats. Nongreasy: common examples include fruit juices, wine, soda/pop, dye and mud. Combination: common examples include mayonnaise, tomato sauce, salad dressing, soups and chocolate syrup. Step 2: Determine constraints of fabric you are attempting to clean. (Note: the do-it-yourself remedies contained in this article assume it is okay to wet-clean fabrics. If an item says ‘Dry Clean Only’ or you are unsure, consult with a professional dry cleaner before attempting to clean with these remedies). Step 3: Test. 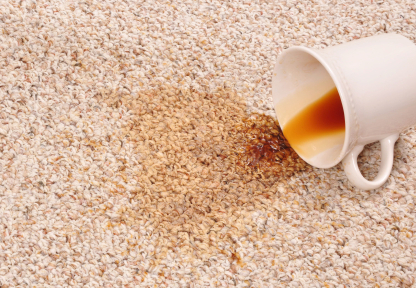 If you are unsure about damaging your fabric, carpet or other textile, always test your stain removal solution in a low-visibility spot to see how it reacts. Step 4: Stop. While effective stain removal often involves several steps, you should stop treating at the earliest possible step to limit risk of damage and deterioration to fabrics. Step 5: Obtain Tools. Some useful solutions and tools to keep on hand for stain removal are as follows: acetone (basically, nail polish remover), ammonia* (for starred items, see precautionary notes at the end of the article), white vinegar*, chlorine bleach (a strong bleaching agent)*, hydrogen peroxide (a milder bleaching agent)*, corn starch, dishwashing liquid, glycerine, white vinegar, rubbing alcohol, an oxidizing solution, a nonflammable dry-cleaning solution, and an assortment of clean sponges and strong-bristled brushes (toothbrushes work great for working detergents into laundry stains). To treat most greasy stains, work detergent directly into stain and rinse with hot water. If that does not work, a dry cleaning fluid may be needed. However, many dry cleaning solutions are flammable, so pay close attention to label warnings and do not place fabrics into a clothes dryer or expose to other heat sources or flame after treating with these solutions. To treat most nongreasy stains sponge immediately with cold water. Soak (also in cold water) if sponging is not sufficient to remove most of stain. Work liquid detergent into the remaining stain and rinse. Use small quantities of diluted (1:1 ratio) hydrogen peroxide (mild) or chlorine bleach (strong) to remove final traces of stain (excluding any items that specify no bleach such as silks, wools, and many synthetics). Combination stains should be treated like greasy stains with the exception that fabrics should be allowed to dry before applying dry-cleaning fluid to remove any greasy residues and/or repeating the stain removal process if necessary. Coffee/tea. If black, follow directions for nongreasy stains; if milk or cream has been added, follow directions for combination stains, but do not use heat as it may set a coffee or tea stain. Chewing gum. Rub with ice cubes then scrape with a dull knife. Sponge any remaining gum with dry-cleaning fluid. Then sponge with warm water to remove any remaining sugar stain. Fruit or vegetable juice. Sponge quickly and/or soak both using cold water. Do not apply heat as it may set the stain. Work liquid detergent into the stain and rinse. If residue remains, treat with a small quantity of white vinegar, then repeat with detergent and water. Blood. Soak in cold water until stain fades. Do not apply heat as it may set the stain. Wash with warm water and detergent. Persistent bloodstains may be treated with a few drops of ammonia (*see precautions below). Wax. Scrape off as much wax as possible with a dull knife. Placed stained area between paper towels and apply warm iron, changing paper towels as needed to absorb wax. Remove final traces of wax with dry-cleaning fluid. If wax is colored and leaves a dye residue, treat with a 1:1 solution of alcohol and water then rinse with water. Grass. Sponge with alcohol (note: test first to see how alcohol will affect colors and dilute 1:2, alcohol to water if treating fabrics containing acetate). Work liquid detergent into stain and rinse with cold water. If needed, apply a few drops of ammonia (*see precautions below) and then launder. Perspiration. Sponge new stains with ammonia and older stains with white vinegar, taking specified precautions for both. If sponging treatment affects appearance of dye, use the opposite (ammonia or vinegar) in solution with water to restore. Use dry-cleaning fluid to treat any remaining oily residue then launder as usual. Treat persistent odor by soaking in a solution of 4 tbsp salt to 1-quart of warm water for at least one hour. Wine. Promptly work in concentrated solution of glycerine and detergent. Leave in for a few minutes then sponge with cold water. If stain persists, apply ammonia and water, taking specified precautions. If stain turns from blue to pink, use white vinegar to turn it blue again and use bleach on the blue stain (using all precautions for bleach and ensuring all traces of ammonia are removed first). Mildew. Remove spores by brushing outdoors if possible. Wash with soap and water and dry in sun. Sponge mildewed rugs with thick soap suds or rug cleaner, remove suds with clean sponge and dry in sun if possible or with an electric fan. *Precautions for ammonia: dilute 1:1 with water for silk or wool. If ammonia changes appearance of fabric dye, rinse with water and white vinegar solution to restore. Never mix with bleach. Precautions for white vinegar: If white vinegar changes appearance of fabric dye, rinse with water and ammonia solution to restore. Precautions for bleaches: dilute 1:1 with water and rinse well. Do not use chlorine bleach on silks, wools, synthetics such as spandex, or flame-proofed fabrics. Never mix with ammonia.